These are the four Longstreet generals still battling it out in our club campaign. In mid-1863 the Southern gentlemen (still) have an unbeaten string of victories under their belt. The Union generals have the benefit of knowing that in the end, Victory will be theirs. A War is not won in a single battle, but maybe they will win a single battle in this war, who knows. This hero of the South hails from Alabama. His years of service in the antebellum Artillery arm of the US Army has been put into good use to uphold the States’ rights. He is loved and admired by his men, as he has managed to keep a large part of his original brigade alive after two and a half years of hard fighting. He is also known for being politically very savvy, but his hard fighting spirit clearly shows he is no “political general”, rather a true officer, gentleman and a cavalier. “Old reaper” Giraud is a Louisiana native. After West Point he served in the Mexican War where he gained honour (and lost three fingers) in the battle of Sequalteplan under Major Polk. “Old Reaper” personally stormed a house armed only with a stick of dynamite and a pistol, killed several Mexican guerrillas and liberated a captured american supply mule. He then went on to put his engineering skills to good use in the railroad industry, and finally struck gold when he married the daughter and heiress of his Pennsylvanian boss and railroad magnate Ulric McScrooge. 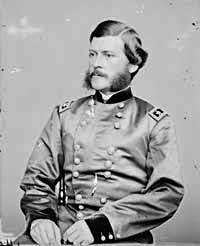 The Secession posed him with a problem – whether to follow his native bloodline and don a grey uniform, or join the ranks of the Union forces in his adopted state. Without hesitation he chose not to turn his back on his industrial empire, horse breeding business, and massive wealth, and embraced the forces of moral integrity – the Union. 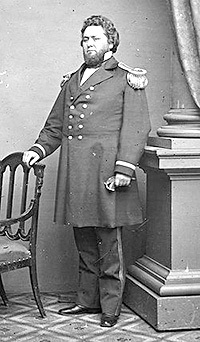 Errol S. Jennngs is one of the wealthiest and best connected generals in the entire Union Corps of General Titdither. 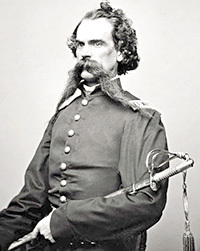 His intimate personal and business relationship with the Governor of Minnesota guaranteed his nomination as a brigadier, and ensured his rapid promotion to the command of the Jennings-Giraud division. 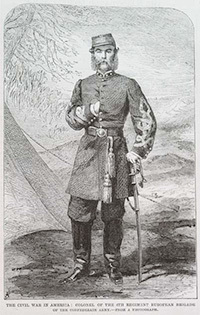 General Jennings is known for his hard-charging tactics and ruthless attacks, which have been widely praised in the newspapers back home, thus raising General Jennings to undisputed heights of glory and renown. Virginia native General Woodster was born a farmer, and his love of the soil could very well had left him there. Fate (not his horse Fate, but the other kind) had other ideas, and now he is known through the land for his exploits in the Wild West, where he fought the savage Indians for many years, learning the craft of scouting and reconnoitering better than any other general of the South. This is not least because his incredible affinity and unflappable energy to write about it to everybody and then some. He is very proud of his Louisiana brigade, made of tough New Orleans emigrants, hard native warriors of the Bayou, and supported by hard-charging riders from Texas. So proud that in more than one occasion his future in the army has been in doubt for zealously refusing to allow any detachments of his boys even on battlefield. For this protective attitude and honorable reputation his men love him universally and would risk death for him.